In obedience to the law of Moses, Joseph and Mary come to the temple 40 days after the birth of their son Jesus to make the customary gift of two turtle doves in thanksgiving – they are greeted by Simeon the Prophet and Anna (who living in the temple and most likely knew Mary all of Mary’s life). Simeon in prayer had been promised that his eyes would see the Messiah and Anna knew through her prayer of the suffering, Mary would need to embrace in being the Mother of the Savior. Mary is told her own heart will be pierced with many sorrows. for my own eyes have seen the Savior of the world. Our present age puts us in constant contact with what it means to embrace life in its fullness – to know suffering. Our present age also makes it possible for the person with spiritual eyes and ears and yes arms to embrace as Simeon did the Savior. I invite you to take some quiet time and with your imagination greet Mary, Joseph, and the infant Christ. From your own heart pray a canticle of praise to Christ who is the light in the darkness; the Christ who has come to save the nations; who has come that we might have life and light and freedom and peace! 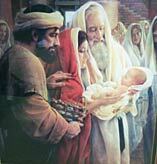 Sunday, February 2nd is sometimes referred to as Candlemas Day. May the candles at your place of worship reassure you that the light of Christ is always there to guide you on your journey.